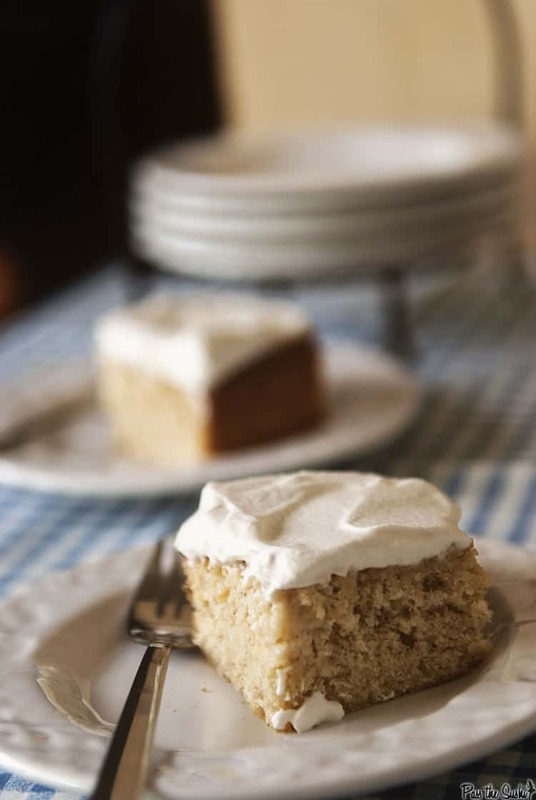 This Tres Leches cake is perfect. It’s a ruin your weight watchers plan binge eat half the cake with a fork for breakfast and hide the rest for later kind of good. Cinco de Mayo is almost here and I am really really sad. I’m pretty sure I could eat Mexican for an entire month long celebration of Cinco de Mayo if we wanted to make this party last… But I’m also sure I would be painfully single and looking for a place to rent on the cheap too as Handsome patiently puts up with a few Mexican recipes by eating a bag of Chex mix for dinner but wouldn’t have it for a month straight. But we’re finishing out the Cinco de Mayo celebration on PtS and GirlCarnivore with a bang! Second, the handy dandy BEAST of a machine I used to make this was awesome. The guys and gals over at BigKitchen sent me an awesome Cuisinart Hand Mixer to test out and like a big tool I sat on it for a while. I had a hand mixer once, and it ruined hand mixing relations for me for a long time. It had two speeds, off, and oh god the kitchens on fire. There was nothing that could be effectively mixed with it. So, even though I hated washing the bowl and mixer every time I needed to whip something up, I ended up relying on Betsy, the KitchenAid stand mixer, for every little thing. That was until yesterday morning, when I needed to whip this topping up in no time, snap pics and get to work. This amazing dodad comes with a whisk attachment! And it has 9 speeds, and an engine like a tank, so it gracefully powered up to speed and whipped the frosting into soft peaks in no time. I was genuinely shocked it did such an amazing job. Even though I do love Betsy, its going to be great making pancakes, brownies, and quick breads without having to haul out so many big supplies. Wanna know the best part? The ever patient, ever awesome people at BigKitchen are sending one to a lucky reader as well! Hop to the bottom of this post for details! 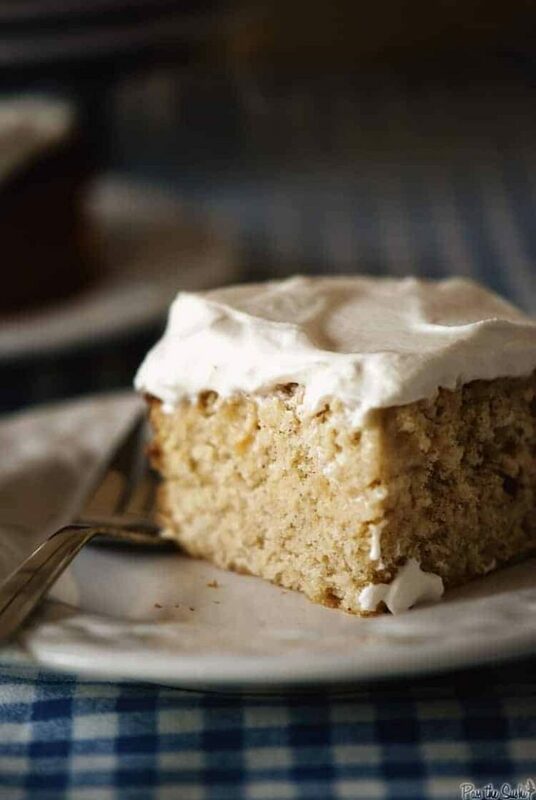 If you’ve tried this Tres Leches recipe or any other recipe on passthesushi.com please don’t forget to rate the recipe and let me know where you found it in the comments below. I love hearing from you! You can also follow along for more good eats and travel tips on Instagram @passthesushi & @girlcarnivore, Twitter & Facebook. 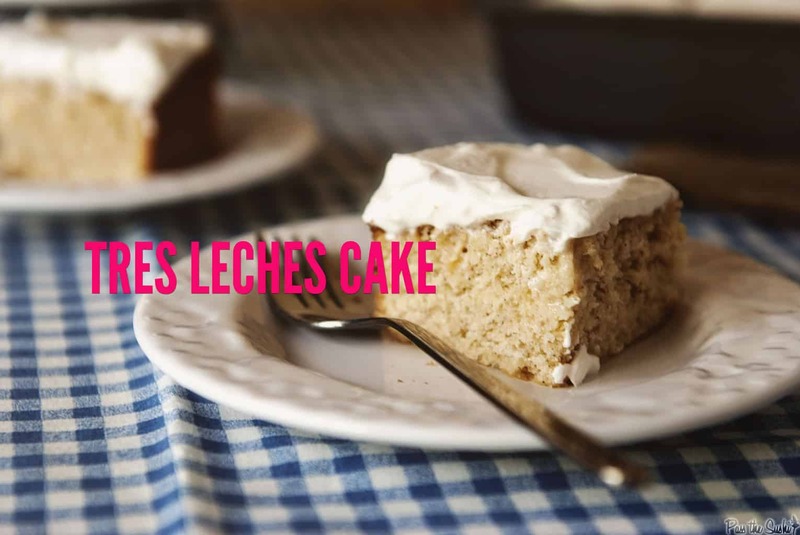 Tres Leches means three milks, which can make for an awfully heavy and dense cake when you think about it. But the magic elves in the Cook's kitchen made this work in big ways without falling to a soggy mess. Put the condensed milk into a microwave safe bowl (use a big one). Cover tightly (no joke) with plastic wrap and microwave on low power for 9-15 minutes, stirring and replacing the plastic wrap every 3 minutes. Seriously, replace the plastic wrap every 3 minutes. Watch the microwave like a hawk. This goes from awesome to sticky hot mess all over your microwave in seconds. Not that I would know. When slightly darkened and thickened, remove plastic wrap and slowly whisk in the evaporated milk, cream, and vanilla. Cover and set aside. preheat the oven to 325 degrees and grease a 9x13 baking dish. Whisk the flour, baking powder, salt and cinnamon in a bowl and set aside. Melt the butter with milk in a small saucepan over low heat. Remove from heat to cool. Using a stand mixer fitted with the whisk attachment, whip the eggs on medium speed until foamy, about 30 seconds. Slowly add the sugar, and continue to whip until incorporated, 5 to 10 seconds. Increase the speed on that bad boy to medium-high and whip those eggs until they are thick and glossy, 5 to 7 minutes longer. Reduce the speed and pour in the milk and butter mixture and vanilla. Add the flour mixture, in three additions, scraping down the sides as needed with a rubber spatula. 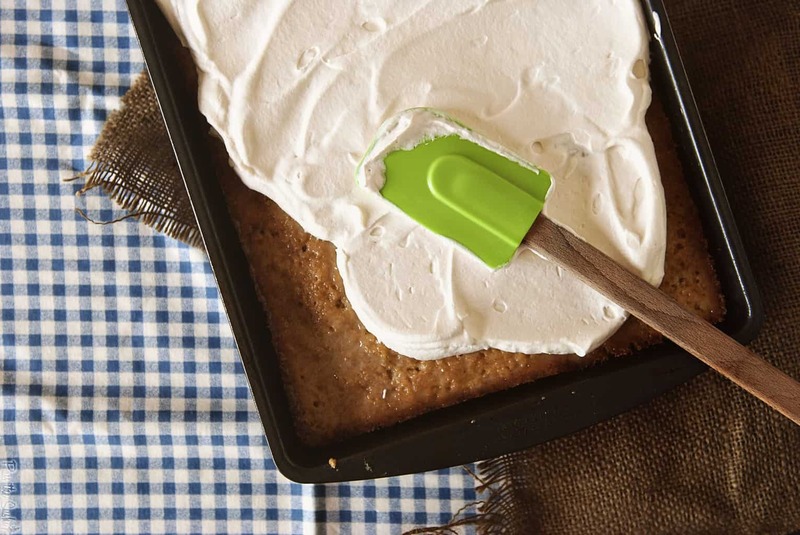 Spread cake batter into prepared baking dish and bake for 30-35 minutes until toothpick inserted in the center comes out clean. Cool on a wire rack for 10 minutes. Using a wooden skewer (bigger than a toothpick), pole holes all over the top of the cake at 1/2" intervals. Slowly pour the milk mixture over the cake until incorporated I poured a little at a time in different areas and let it be absorbed before continuing on. Let sit at room temperature for 15 minutes before placing in the fridge for 3 to 24 hours, uncovered. Remove the cake from the fridge 30 minutes right before serving. Using a stand mixer (or a hand held mixer with the whisk attachment) whip the cream, corn syrup, and vanilla on medium low speed until foamy, about 1 minute. Increase the speed gradually to avoid splatter and whip until soft peaks for about 2-3 minutes. Spread over cake, slice and serve. To enter to win your own Cuisinart Mixer hop over to BigKitchen then come back here and tell me what the dreamiest product was. And as always, I’m a totally down for bribes and flattery. Entrees accepted through midnight Friday May 10th 2013. Winner will be contacted by email announced on May 14th’s post. Winner must live in the United States. Wish I lived in the US to join the giveaway! I looooove tres leche cake. Bees knees, shnizzle and boom back to you too! Happy cinco de mayo. YUM! i have never had this cake but it sounds so good! I’m right there with you! We could eat Mexican together every day and race each other in our Hoverounds because we wouldn’t be able to walk! I’m a big fan of Tres Leche cake too. How could it be bad with 3 milks?! 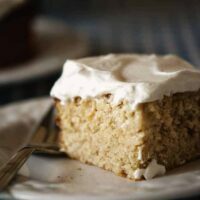 I think I’ve only have tres leches cake once – and it was at a wedding! Very good but never think to make it for some unknown reason. As for Big Kitchen, I’m dreaming of the entire set of AllClad pans. This is my all time favorite cake! I love the whistling tea kettle! This cake makes my mouth water though! I like Pass the Sushi on facebook! I like Big Kitchen on facebook! I follow Big Kitchen on twitter! I would love to be eating this cake for breakfast, it looks incredible. I follow you on twitter. I follow PtS on FB. I am now following BigKitchen on FB. Love this cake. I am all for using a fork at breakfast time and devouring it. It would be worth the extra miles of exercise. The Big Kitchen has soooooo much to offer. I liked the Chat Pack Conversation Icebreaker Cards for KidsConversation. It sounds like a great idea for a crowd of kids who don’t know each other at a party. I already follow you on facebook. 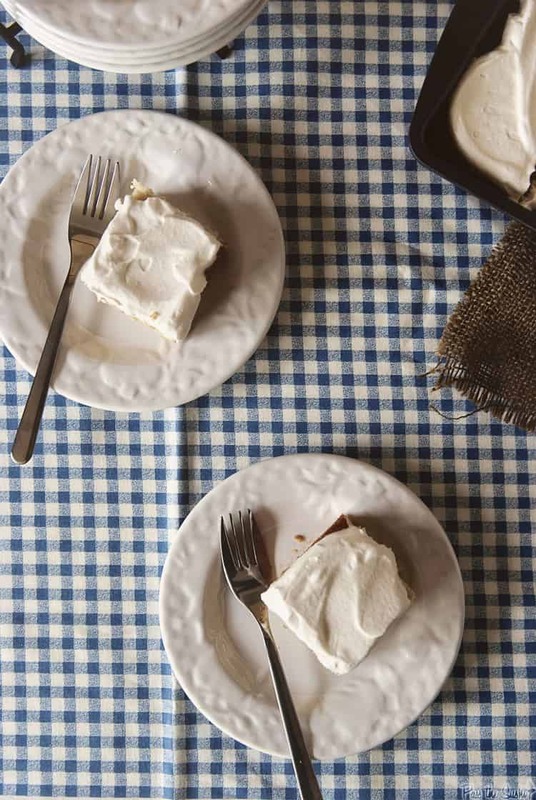 I have never had Tres Leche Cake but I will definitely have to try it. It sounds wonderful. Any of their salt and pepper shakers is adorable! I think we may have had the same hand mixer. Mine has two settings also. Off and all of your flour is now on your pants. Very convenient. And I have a BF who doesn’t like Mexican food either. We can get together and send the men off to watch baseball or something and we can eat tacos and chili. Then this cake. Yum. I like that cuisinart griddler. Need to up my pancake game here! Happy Cinco de Mayo, Kita! I’m wishing I had everything on hand to make this cake this afternoon – just one last treat before the day is over! Though km in shock it’s May, I’m over the moon with this cake! This is by no means the ‘dreamiest,’ but, I’ve wanted it forever: the kitchenaid pasta maker attachment. I follow PtS on facebook. I follow PtS on twitter. I could eat this cake Cinco de Mayo or not! Looks amazing! Your cake is definitely the bees knees! I would love to start making my own ground meat, so I’m going with their Chef’s choice meat grinder attachment for the KitchenAid mixer. All dreamy, but I’ll pick the Breville Ikon juice fountain. I love the Soleil cookware from La Creuset. Thanks for the chance to win! I am following PassTheSushi on Twitter via @AlphaBecky. 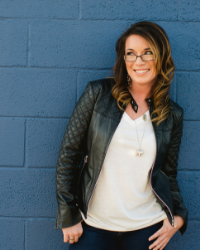 I am following @BigKitchenStore on Twitter via @AlphaBecky. I shared the giveaway on Google+. I adore tres leches cake. So flavorful and moist.